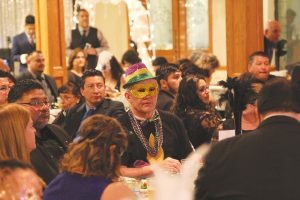 The Fountains of Lockhart was a packed house Saturday night as the Greater Caldwell County Hispanic Chamber of Commerce hosted its annual banquet, honoring local business leaders and celebrating its 30th anniversary. Keynote speaker Joe Morin, a retired executive with the Texas Department of Economic Development, said the chamber’s biggest accomplishment was a deceptively difficult one. “It has survived with flying colors,” Morin said, listing a number of businesses like Compaq and Enron, which, for various reasons, have not weathered the test of time. “It has supported events like Cinco de Mayo and Diez y Seis that bring us food, music and art, and its continued support of education is something we can all be proud of. Morin said a growing Hispanic population contributed to a strengthening economy. “If U.S. Hispanics were a country, we’d be the seventh largest economy in the world,” Morin said. To read the full story, pick up a copy of the Post-Register.